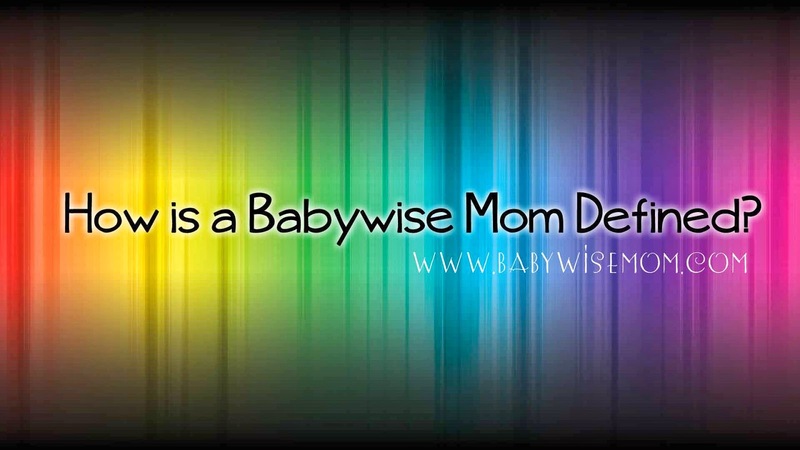 How Is A Babywise Mom Defined? I was reflecting on what it means to be a “babywise mom.” What is a babywise mom like? What actions does she take as a parent? It struck me how very diverse babywise moms are. Let me elaborate. Among babywise moms, you will find a whole spectrum of parenting practices. You will find moms who would label themselves as crunchy (for those who don’t know, “crunchy” is the new “granola”). One mom commented based on the definition of crunchy that she must be “soggy” :). You will find moms who cloth diaper and moms who use disposable diapers. You will find moms to do early potty training and moms who use diapers until the child is begging to wear underwear. If you talk to a group of Babywise moms, you will find moms who breastfeed for a year. You will find moms who follow extended breastfeeding far beyond a year. You will find moms who breastfeed from every interval between 0-12 months. You will meet moms who have never breastfed and feed formula. You will also find moms who label themselves as “exclusive pumpers” and pump milk to feed their babies through bottles. You will find moms who follow baby led weaning and moms who stick to purees until baby is a bit older. You will get to know moms who birth at home with a midwife and moms who birth at the hospital and an epidural, and everything in between. You will find moms who are “stay at home” moms and moms who work at least forty hours per week, and everything in between. You will meet moms who work from home. You will meet moms trying to start up new businesses. You will meet crafty moms, funny moms, smart moms, shy moms, bold moms, musical moms, creative moms, and logical moms. Extroverts and introverts are among us. Those who love the limelight and those happy to stand to the side and watch all make up our large circle of babywise moms. We represent many religious beliefs. There are Christian moms, Atheist/Agnostic moms, Jewish moms, and Buddhist moms, among others. We have vegetarian moms and meat-loving moms. We have moms who are organic only and moms who use whatever is available. We have moms who homeschool, moms who are private school only, and moms who love public school. Some babywise moms follow the AAP on vaccination recommendations. Others take a slower vaccination approach. And others don’t vaccinate at all. Wow! We have a lot of diversity among us! It is not so easy to put us in a box and label us. We have many moms who are polar opposites on today’s hot-button issues. Now, here is the part I think is so neat. We get along really well. Really, really well. Why is that? I think we all have some important things in common. Most of all, we believe in respecting others. We believe that other people are precious–even when they don’t agree with us. We believe in good manners, even when the other person is some unknown face on the other side of a computer screen half a world away. We treat people online the same as we would treat them face to face. I believe that is the key to why we get along well. I am a member of several Babywise groups online. Over the last couple of years, I have noticed that we as a whole have gone from discussing only “babywise” related topics to discussing all parenting topics in these groups. We value the opinions of each other. Many of us are big into personal research and like to study things out for ourselves. I see these hot-button issues discussed over and over. There are always moms who feel very passionate on each side of the coin, and they are always respectful toward each other. I see more hot-button topics in the Chronicles Yahoo Group than any other. They are wonderful! They are full of insight and you really come to understand the reasoning behind the beliefs of others. There is no name calling. No “low blows.” Just discussion among adults. This is something 100% unique to Babywise groups. I haven’t seen it in any other group that I have been a part of online. I think some Babywise parents start Babywise only concerned about getting eating and sleeping on track. I think that is where I was when I first started with Brayden. I soon saw there was so much more to offer. I saw that because eating and sleeping were on track, I could focus on training him to be a good person. A person who respects people, loves people, and serves people. A person who was a hard, honest worker. A person who valued learning and a person who could control and discipline himself in pursuit of greater goals. These were goals that were far superior in the grand scheme of things than eating and sleeping–the eating and sleeping were just excellent stepping stones to enable us to work on these things. Yes, we babywise moms value structure and predictability. But more than that, we share a common ultimate parenting goal, and we understand that the many hows along the way, like cloth vs. disposable diapers, do not interfere with our end “why” goal. So thank you babywise moms for being so great. And thank you to the moms who read this blog but wouldn’t define themselves as “babywise moms.” You are also always kind and respectful even when disagreeing. Babywise mom's are hard workers. Babywise is not easy (at the beginning and "in general"), we essentially sacrifice the first year of our baby's life to begin a solid foundation, napping at home, early bedtimes and not on the go go go. Selfless and self-sacrificing people are respectful people…you got it right! I love this blog and the group…. :) Thanks for this post! i wish i had babywise moms in my local community, it's so hard to feel so alone in it!!! And dare I add that Babywise moms are well-rested moms? =)I find I generally don't fit in with most mom labels, specifically because I do Babywise, so I appreciate this post. Thanks! Your comment about eating and sleeping being the foundation for good parenting is so true! I remember the first time I read Babywise 2 I was at first disappointed that it didn't continue with the eating/sleeping/routine theme in the first book. Then I started realizing that this method is so much more than that! The books and your blog have helped me be a better mom. Thanks so much for your selfless service! What a great post Valerie. I love my babywise moms! This was a great post, I even got all teary eyed thinking about how great our Babywise group is on babycenter. Everyone is seriously so supportive and kind. People are helpful without being know-it-alls, and those who are having problems graciously heed the advice of other moms, whether they follow everything or not they thank people for their thoughts. I know I am a better mother and wife because of the past year and a half of being a part of the group. You're right that most of us started out concerned mostly about getting some sleep and organizing feedings so we knew our babies were well fed, but it does become so much more than that. Because I'm not fighting bedtime battles with my son at 20 months we can move on to other issues, like potty training, first time obedience, and understanding healthy boundaries. I'm not constantly exhausted so I've had time to develop new interests and research things like being a better wife and mother, homeschooling options, or even just learning how to sew and cook. I still can't quite figure out what is so unique about the Babywise moms that we have so little drama except that we have similar goals, our "why" is the same and we understand that the "how" is not nearly as important. There's some peace and perspective that comes along with that way of thinking. I come from Kosovo – Europe, and i come from a culture that parenting is terrible, a lot of misconceptions. I have been introduced to BW from American friends and it made a big difference in our lives eventhough people here think that my baby is a good baby and it is not the methods that i have used with her.The blog is so helpful. I am an exlusive pumper, do you know of any moms/blogs about this?Thank you for this post, and help and love. I feel that I have a secret with BW that all moms need to know. I find myself talking about it to moms constantly! If only moms everywhere could know what we know as BW moms! It is my goal to help inform others, because this works! Trisha, I completely agree about feeling like you have a secret that all moms need to know! I love to share with people how my DS and I got to where we are and how I have such a well-mannered, well-rested child!It is such a joy and honor to be a part of this BW group of moms who is always supportive and loving! Thanks for hleping us make it through the first year with grace, dignity, love, joy and sleep! Happy 1st birthday, Little Man! I cannot express how much I love this post. I recently did a post on my blog listing books and ideas that I have learned/used along the way and I put Babywise at the top of the list. I got some negative feedback and most comments said Babywise did not work for those commenting. I even read a post written by a friend on her blog in response to mine saying that research shows that Babywise babies are malnourished and show failure to thrive. I find it so interesting how much moms who don't do Babywise get really fired up about the ones who do. It can be overwhelming and hurtful, but then I look at my incredibly happy, healthy, bouncy 9 month old who rarely cries and sleeps and eats like a champ and those feelings disappear. Thank you for being such a great resource and example! i loved this post too. what else i love is that it seems that bw moms don't criticize other mother's parenting method. i get so upset hearing that "babywise is child abuse" or things similar to that. i think a mother has a right to raise her child however she would like- so long as they are safe, and i think bw mom's see the beauty in that!love this blog! Well said. Thank you. This is very true. What an awesome post! And I have to say that I align with Jane! I've come across some awful things in regard to BW lately and I get so fired up about it! But what she said is true – all I have to do is look at my beautiful, happy, thriving little girl and know that those people are just jealous they haven't slept in a year! It can be hard in my mom's groups – I feel so bad saying that Bella started sleeping through the night at 8 weeks and that she hardly ever cries. But that's my reality thanks to Baby Wise, and I'll never stop being grateful to my friend for recommending the book. You are welcome to everyone! And thanks for sharing your own thoughts! Tiffany, I am not sure why you deleted your comment, but thanks! I liked it. Agnesa, I don't know any blogs about that, but I do know there are moms in the Chronicles Yahoo! Group who do/did that. If you went in and started a thread on it, you would get lots of replies!